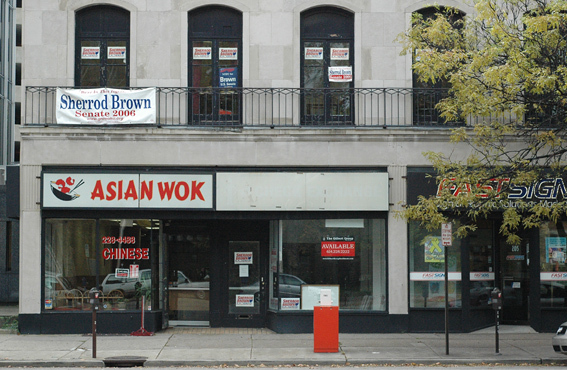 November 1, 2006--Democratic U.S. Senate candidate Rep. Sherrod Brown's Franklin County field office at 203 E. Broad Street in Columbus, located conveniently above the Asian Wok restaurant, is a hive of activity. 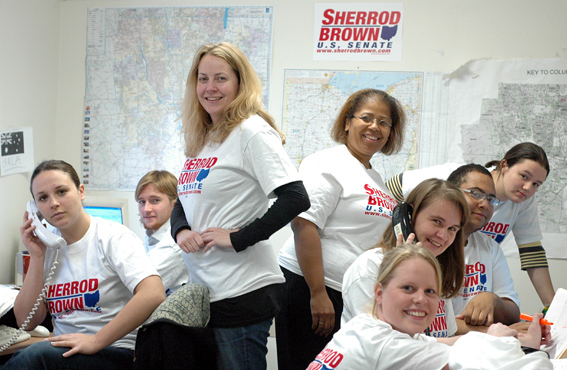 L to R. Clare Walsh, a volunteer from the United Kingdom (on the phone); John Stuhlberg, a volunteer from Rochester, NY; Courtney Johnson, a volunteer from DC; Constituency Outreach Organizer Jackiethia Saunders-Morris (the African American woman); in the very front is Sky Beckwith, Central Ohio Volunteer Coordinator; then an unidentified woman on the phone. Second from right is Sam Liebert of Janesville, Wisconsin. He was trained and positioned by Sen. Russ Feingold's Progressive Patriots Fund. Liebert started with the campaign in early September and is assisting with volunteer coordination. "Ohio's obviously going to turn blue," Liebert said, adding that this will give the Democrats a "much better chance in '08." At far right is Carla Tardivo from Adelaide, Australia. She arrived in mid-October to volunteer on the campaign. "I'm very determined to help Sherrod win this thing," she said. 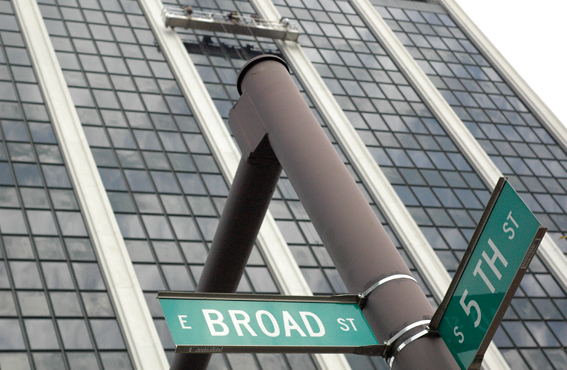 Below: Sen. Mike DeWine's state campaign headquarters are less than a block away on the 16th floor of an office building.